With an updated look, sleek new packaging, the debut of four bold, new flavors and a new campaign, The Coca-Cola Company is re-energizing and modernizing Diet Coke for a new generation of drinkers – and offering its millions of current fans a new look and more flavors. After 35 years, America’s No. 1-selling zero-calorie beverage brand is entering a new era. The two-year innovation process was fueled by consumer research pointing to younger Americans’ affinity for big, yet refreshing and great-tasting, flavors in their favorite foods and beverages – from hoppy craft beers to spicy sauces. The company spoke to more than 10,000 people from across the country to get their ideas and inputs on potential flavor extensions, packaging updates and more. From these insights, Coca-Cola’s R&D team developed and tested more than 30 Diet Coke flavor combinations, featuring tropical, citrus and even botanical notes. Ultimately, Diet Coke landed on four flavors that received the most positive consumer responses. Ginger Lime, Feisty Cherry, Zesty Blood Orange and Twisted Mango bring more variety to the trademark by complementing the unique, crisp taste of Diet Coke with unexpected-yet-delicious tastes. They aim to satisfy adventurous fans’ thirst for bolder tastes and more dynamic and uplifting experiences. 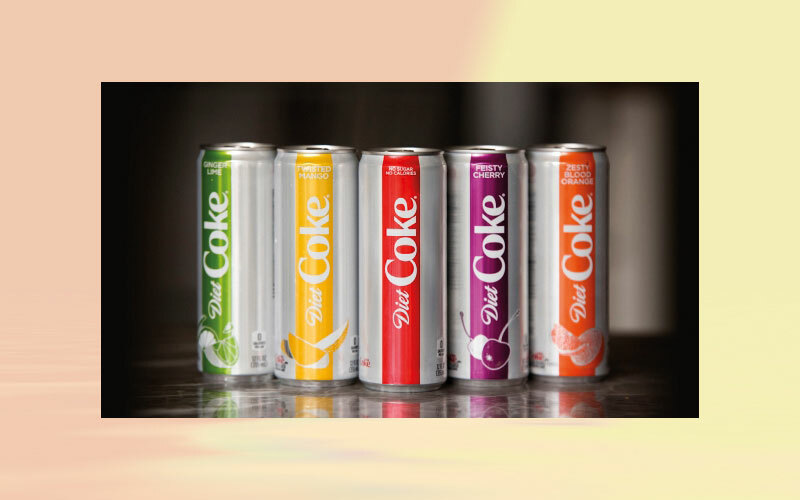 Diet Coke and the new flavors will be packaged in sleek 12-oz. cans and sold as on-the-go singles and in eight-packs. Diet Coke also will continue to be offered in all existing package sizes, such as standard 12-oz. cans, mini cans, glass bottles and more. All new packaging and flavors hit store shelves this month. The sleek cans will give Diet Coke a more contemporary feel. A refreshed visual identity, meanwhile, lives up to Diet Coke’s new flavors and packaging. Anchored by the brand’s iconic silver color, the new look-and-feel has a simplified color palette focused on silver and red with accents of bold color to represent the new flavors. A slightly refined typography simultaneously preserves Diet Coke’s heritage, yet presents it in a more progressive manner. Together, the new packaging designs and visual identity represent a personality evolution – a brand rejuvenation – for Diet Coke. A robust integrated marketing campaign launching later this month will celebrate the delicious, uplifting taste of Diet Coke and express an unapologetic, emboldened point of view for the brand.